Washington State is a wonderful state for family vacations and it’s filled with things to do with kids. The Evergreen State has lots going on any time of year, from water parks and amazing nature opportunities in the summer, hiking and outdoor fun all year round, and snowy adventures in the winter. Both of our Travel with Monsters families live in Washington State and we’re pretty fond of it here. Here are some of our favorite things to do. Above all, and no matter where you’re hanging out in Washington State, you should get outside. The Evergreen State is filled with amazing national parks like the Olympic National Park, state parks, and city and county parks alike. You’ll find sweeping coastlines, lush rain forests, dry deserts, and lots and lots of evergreen expanses to wander. Seattle Center is Seattle’s touristy hub, but it’s also a really fun spot to go with kids. Within its bounds, you’ll find the Space Needle, the Pacific Science Center, Seattle Children’s Museum, Seattle Children’s Theatre, and the International Fountain (great to play in if you bring bathing suits on a hot summer day)…all things your kids will love. And, be warned, if you take on too much at Seattle Center, you’ll leave with a lot less money than you arrived with as each attraction tends to cost in the range of $25 per person. If you have younger kids, aim for the children’s museum. 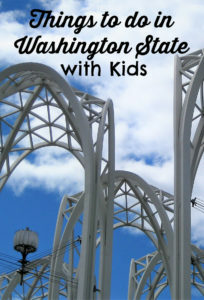 If you have older kids, the Pacific Science Center is sure to be a hit. And there’s plenty to explore for free on the grounds as well! 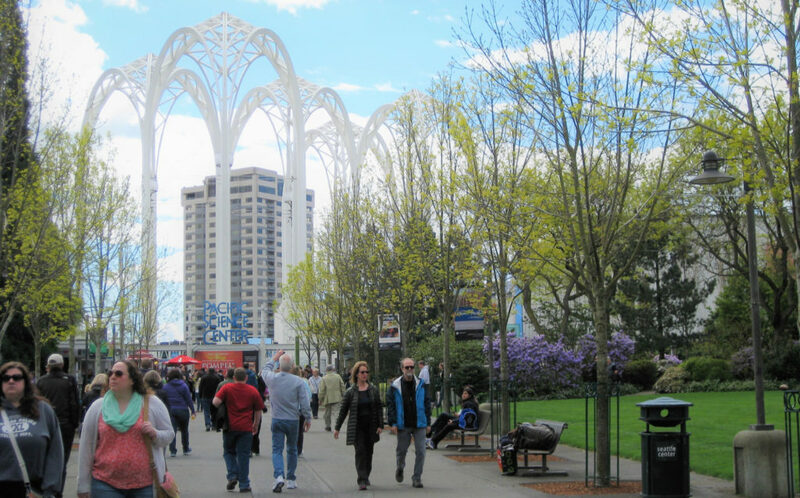 The Pacific Science Center at the Seattle Center is the region’s best science museum with an IMAX theater and special exhibits that pass through. There are children’s museums throughout the state worth checking out if you’re traveling with younger children. If you’re in any kind of city, count on there being a children’s museum to check out. In Seattle, the Seattle Children’s Museum. In Spokane, don’t miss the Mobius Children’s Museum. In Tacoma, there’s the Children’s Museum of Tacoma. In Olympia is the excellent Hands On Children’s Museum. Mt. Rainier is close to Seattle and Tacoma, taking just an hour or two to get to the main gate. For a modest entry fee, you can explore river beds, hike through old growth forests, spot some pretty cool waterfalls, and do it all in the shadow of the towering mountain. Bonus – there are photo ops galore! Just make sure to go on a sunny day or even right at the base of the mountain, you might not be able to see it. No, you won’t be seeing it from the sky when you visit the national park, but it looks pretty cool from planes, too. Olympic National Park is located on Washington’s Olympic Peninsula and is a veritable paradise for families who love being out in nature. Temperate rainforests? Check! Picturesque beaches that will take your breath away? Check! Lots of family-friendly trails and wilderness to explore? Check and check! Read this guide to the ONP for more. Washington Coast is one of those unsung destinations. It’s rarely overcrowded, and long stretches of sandy beach mean lots of space for young travelers to run free, build sandcastles, fly kites (the kite flying on Washington beaches is pretty spectacular), and splash in the freezing cold water (you won’t want to join them most likely, but they’ll have fun). Washington is dotted by state parks, large and small. Visit a park for a day or stay overnight in a cabin, yurt, or campground. State parks are located along shorelines so you can use them to go fishing, kayaking, or otherwise get out on the water, or you can just enjoy splashing in the surf or try skimboarding (popular at Western Washington’s Dash Point State Park). For kids who enjoy learning a little something with their nature, some parks have interpretive centers – like Mt. St. Helens or the Gingko Petrified Forest. 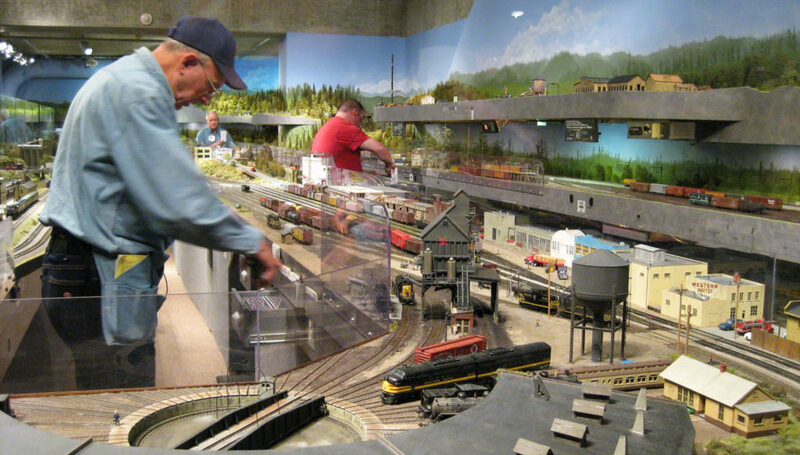 The giant train set at the Washington State History Museum is always a hit with kids…grown ups too…it’s pretty cool. If your kids are past the toddler stage, then other museums might be perfect. If you have a little dinosaur fan in the house, the Burke Museum in Seattle has plenty of dino bones. The Washington State History Museum in Tacoma is especially geared toward younger visitors and has lots of hands-on exhibits and activities. Even museums that you might not think about as kid-friendly destinations like Seattle or Tacoma’s art museums have kid activities and often crafts or hands-on fun. 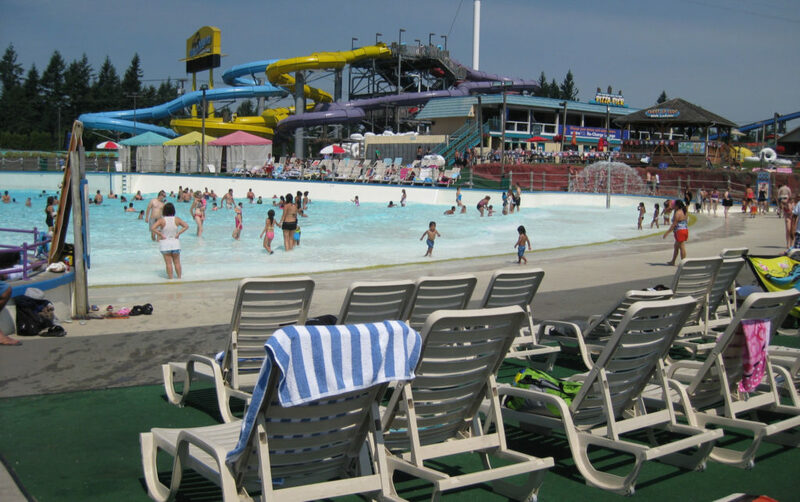 Located between Seattle and Tacoma, Wild Waves is a water park (with a small attached theme park) that is a great place to go on the one hot week we get here in Western Washington (though, your kids probably won’t care if it’s not perfectly water park hot. They’ll just see the waterslides and wave pool and that’s all that matters). Washington State has a few zoos as well as wildlife parks. In Western Washington, Seattle’s Woodland Park Zoo or Seattle Aquarium are always worth visits. To the south of Seattle, Tacoma’s Point Defiance Zoo and Aquarium has both a zoo and aquarium experience wrapped into one. Northwest Trek in Eatonville offers a way to see Northwest animals in more wild habitats. In Spokane, Cat Tales Zoological Park has a focus on big cats. You’ll also find more specialized animal experiences like Cougar Mountain Zoo in Issaquah or Wolf Haven in Tenino. Washington State doesn’t get nearly as much buzz as, say, Utah or Colorado for its snowy fun, but with two mountain ranges running through the state, it goes without saying that there is much fun to be had in the winter. Ski resorts dot the state, but if you’ve got kids, two spots worth checking out include the Summit at Snoqualmie’s tubing hill and White Pass, which is quieter but popular with families. Save this article for later by pinning the pic below! Or follow us on Facebook, Twitter (where Kristin regularly mans the ship), or Instagram (where Suzi documents her life and travels).